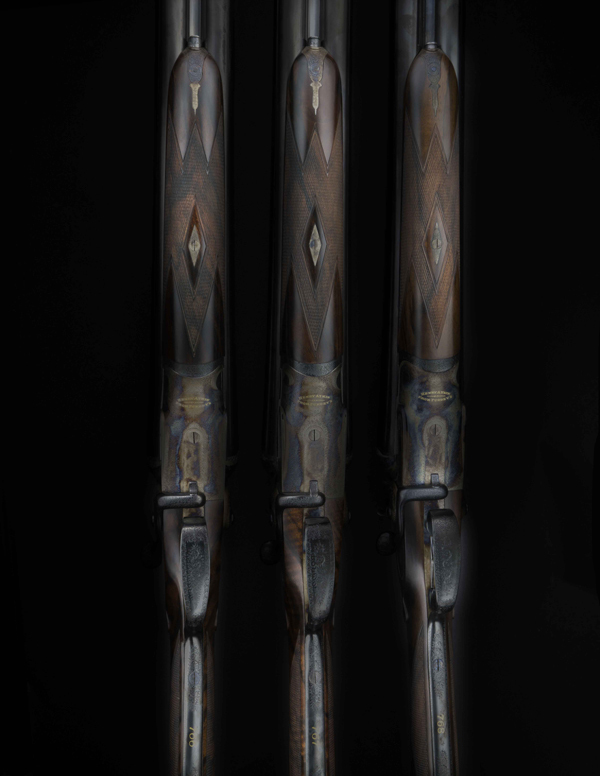 In a lifetime of ogling guns, a few will always stick in my mind’s eye: the first 28-gauge side-by-side I ever saw (a boxlock Westley Richards, c. 1974); a pair of pre-World War I Boss over/unders that emerged from a vintage Bentley at Swinton Park, long ago; the smallbore Purdey-Woodward O/U that a friend casually unpacked one day (“Oh, this? It was a thank-you from my business partners”); Ernest Hemingway’s double .577 Nitro Express . . . and Henry Atkin 12-bores Nos. 766, 767 and 768. The latter were made for, or anyway sold to, John Seymour Wynne-Finch, in London, in 1894. Wynne-Finch was then a 48-year-old major of the Royal Horse Guards and a famous bon vivant. Did the man understand how unusual his guns were or would become? 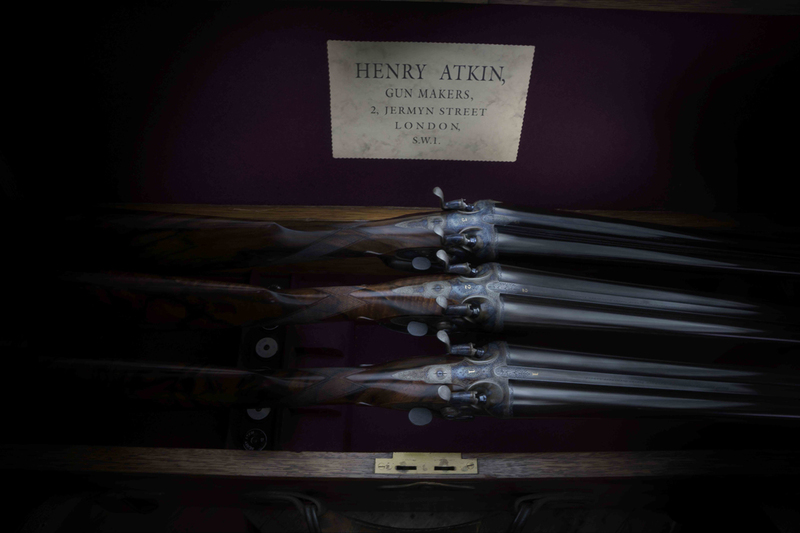 At the time, Henry Atkin made only “best”-grade guns, and these were actioned by none other than John Robertson, who in 1894 was still an outworker to the trade even though by then he was manager and half-owner of Boss & Co. True pairs of London-best hammerguns were never common; add sidelevers (and sideclips), and the number shrinks considerably further. Now consider that these are also ejector guns and that there were three of them, not two; that they now have survived for 123 years, and they’ve been reunited, and they’ve been properly brought back to life . . . . Likely they are unique today, and possibly they were back in 1894 too. 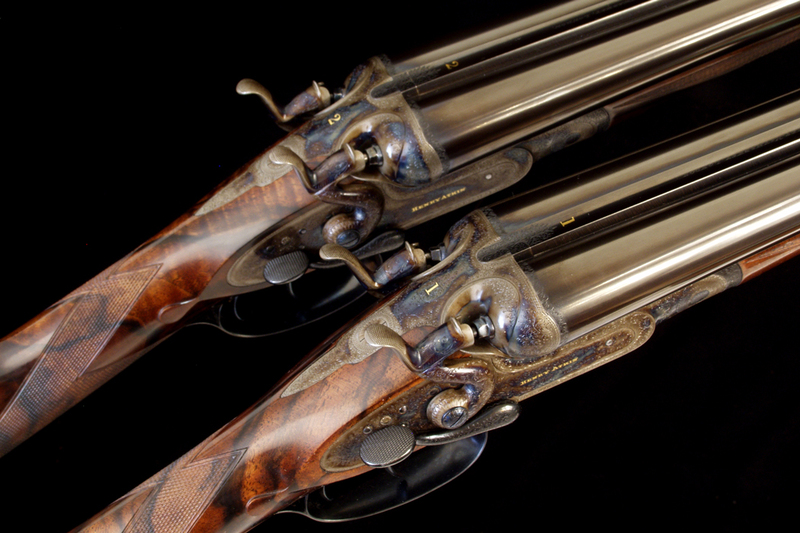 These guns first reappeared in public in 2003 at the sixth Gold Medal Concours d’Elegance of Fine Guns, held with the Vintage Cup that September in Millbrook, New York. 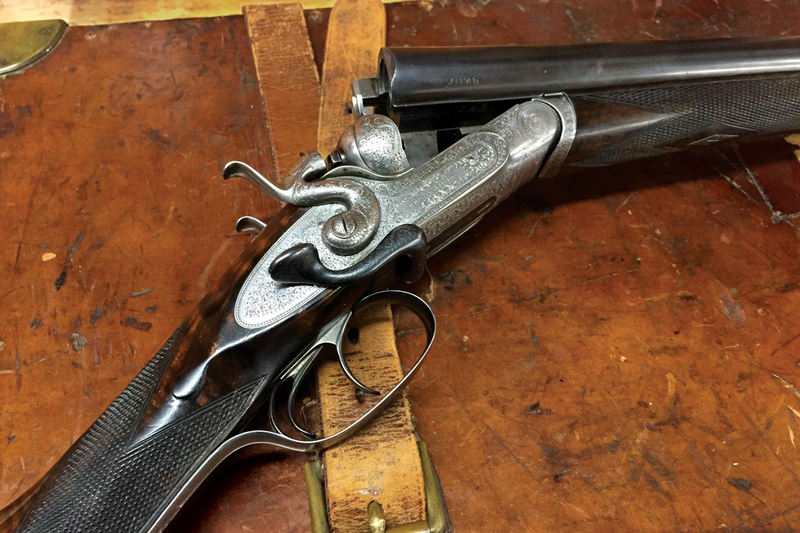 They caused a stir among the Concours judges, nine British and American gun guys (and one Dutchman) who’d seen everything but, without hesitation, unanimously awarded them two gold medals: Best Restoration and Best Matched Pair. Yes, there were only two guns then, Nos. 766 and 767. They had been rebuilt, re-pinned, rebarreled, restocked, re-proofed and refinished to a very high standard “by the maker”—as the crucial phrase goes—while maintaining their classic late-Victorian bones. That wasn’t the first time I’d seen the guns, though. The November before I had been in Scotland with Ken Duglan, then proprietor of gunmaker Atkin Grant & Lang. Ken had the shooting at the Corsewall estate, and our group was staying in a small pub hotel, the Crown, in the nearby fishing village of Portpatrick. Barboured and wellied to the eyeballs, each evening we were blown through the front door by the wind off of the Irish Sea and straight into the cozy snug. Whisky and a peat fire soon set us right, and on Thanksgiving the Crown roasted a turkey and dotted it with American-flag cocktail picks. This was the modern debut of Nos. 766 and 767. 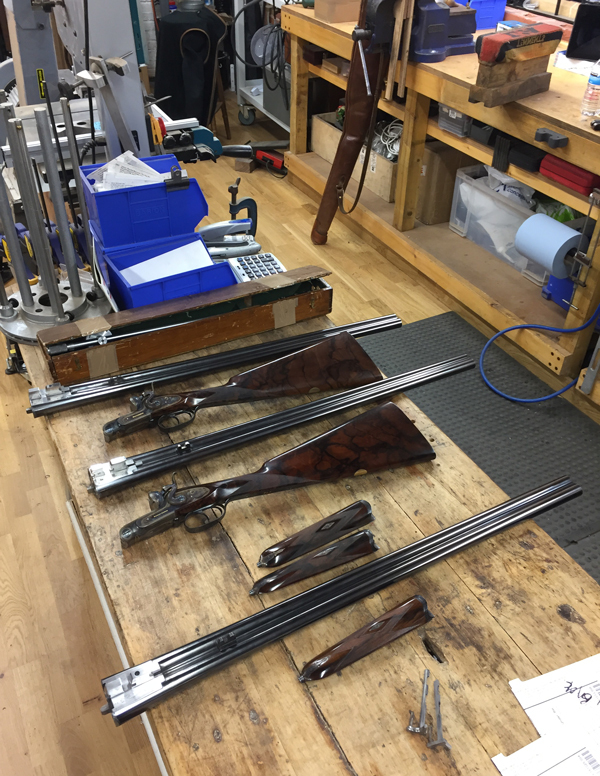 Duglan’s team at AG&L—barrel man Bill Blacker, actioner Gary Hibbert and a couple of lads in their 20s named Stephan Dupille (stocker) and Carl Russell (finisher)—had completed the work, and Ken had brought the guns north to present them to their new owners. Ron Hansen and Len Ceravone were business partners from Connecticut, a couple of trade-school tool-and-die men who’d gambled on opening their own machine shop and come up aces. Len chose the Number 1 gun and Ron took No. 2. They were identical, after all. Four years later, in 2006, Safari Press published Don Masters’ exhaustive history Atkin, Grant & Lang. And there was a big cheesecake photo of the Concours-winning pair: Ron’s and Len’s Henry Atkin sidelever hammer ejectors—but the caption noted that they’d been part of a set of three guns! Who knew? And what had happened to the third one, No. 768? Its siblings had been in desperate shape when they’d been rescued; No. 3 probably had been sold off or given away long before and could be at the bottom of a loch somewhere. Today the trio belongs to Ron Hansen Jr., who got the No. 1 and 2 guns when his father and Len retired and he took over the business, now a highly sophisticated operation called Component Engineers, Inc. Len no longer shoots; Ron Sr. has developed a taste for hunting elk and deer in the Rockies. Ron Jr. took possession of the Trinity in November last year at Hatfield House, where he joined a group heading to the Cotswolds for pheasants and partridge . 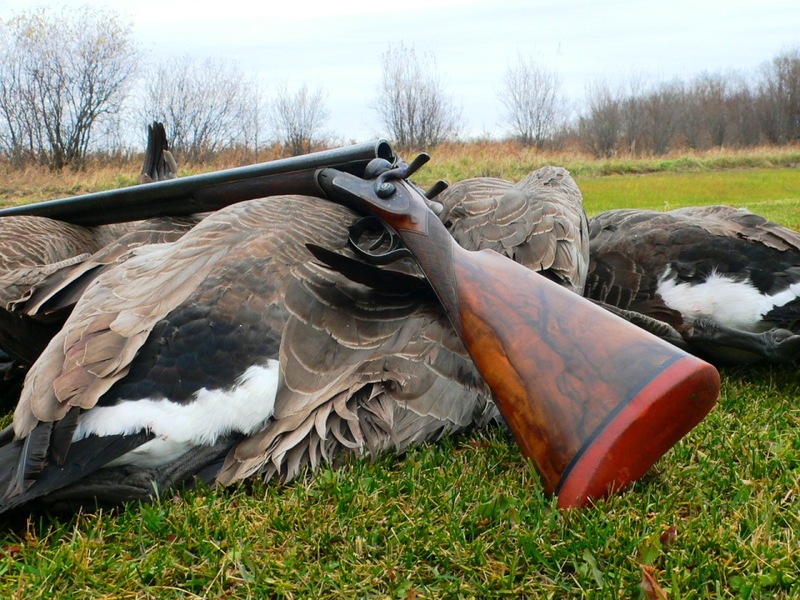 . . and for the first time ever I heard Ken urging a delighted owner not to take his new guns into the field. When 766 and 767 surfaced in the 21st Century, they were used up. Wynne-Finch died in 1906; he could not have exhausted these guns in just 12 years, so they had gone on to other hands and others after them. But now the three together have become museum pieces. Shoot them? Would you take an Aston Martin DB4GT Zagato out in traffic? Of course shoot them that is what they were made for. If and when the barrels need to be re-blacked or the stock needs refinished fine craftsman are just around the corner.